Could you ever fall in love with a zombie? Don’t answer too quickly. The point at which humanity ends is open to debate in Sabu’s intimately stripped down Miss Zombie (trailer here), which screens during the 2014 Seattle International Film Festival. In the very near future, zombies are a fact of life, but Dr. Teramoto is still rather surprised when an old colleague ships him one for safe-keeping. As long as they do not feed Shara meat, she should remain docile, but her instructions come with a handy pistol, just in case (hello Chekhov). In spite of the neighbors’ protests, Shara soon settles into a Sisyphean existence scrubbing the Teramotos’ flagstone veranda. However, Shara seems to inspire very human-like responses from those around her. Teramoto’s wife Shizuko feels pity for her, while their son Kenichi is fascinated by her mysterious presence. Unfortunately, the doctor’s lecherous groundskeepers act on their vilest impulses towards her, with his silent acquiescence. When tragedy unexpectedly strikes, Shara’s relationship with the family will become far more complex. Miss Zombie has the general sensibilities of the zombie film Joseph Losey never made. To a large extent, the human exploitation of zombies represents more conventional class and gender conflicts (which are present too, barely contained beneath the film’s surface). It also directly explores notions of human sentiency, hinting at lingering sense memories from Shara’s previous life. Without question, Ayaka Komatsu gives the finest zombie performance probably ever. She is the film’s lynchpin, anchor, and all-around MVP. Watching her so subtly yet so vividly project her stirrings of memory and consciousness is absolutely heartbreaking. Bub from Day of the Dead simply cannot hold a candle to her. She also gets some key support from Makoto Togashi and young Riku Onishi, as Shizuko and Kenichi Teramoto, who figure prominently in the emotionally heavy third act. Fortunately, Sabu’s relatively simple but deep-as-the-ocean story is worthy of her efforts. For a genre film, Miss Zombie packs a shocking wallop of a punch. Daisuke Sôma’s mostly black-and-white cinematography is also unusually stylish, conveying a vibe that is part old school Romero and part Cassavetes. 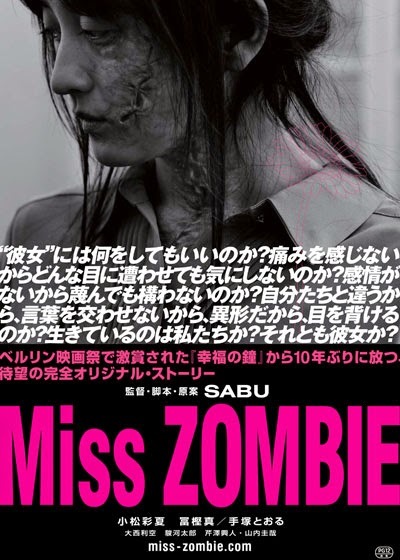 With Miss Zombie, Sabu really raises the stakes for zombie films. The same old shuffling hordes simply will not cut it anymore. It ranks alongside the original Night of the Living Dead, but takes viewers to a very different place. Highly recommended for genre fans and those who appreciate social allegories of any stripe, Miss Zombie screens Friday (5/16), Saturday (5/24) and Sunday (5/25) during this year’s Seattle International Film Festival.